China will need more than three times as much milk by 2050 as it produced in 2010 and, without changes to its current supply lines, the demand will lift global greenhouse gas emissions from dairy herds by 35%, expand dairy land by 32% and increase nitrogen pollution from dairy production by 48%. "The consequences of sticking to a 'business-as-usual' scenario are unthinkable," says Zhaohai Bai, an associate professor at the Chinese Academy of Sciences and lead author of a paper from a multinational team of environmental scientists published today in Global Change Biology. The obvious alternatives are not attractive either, notes Bai. Producing all the extra milk in China alone would add the environmental burden of huge animal feed imports, while importing the extra milk wholesale would simply shift the problems to milk exporting nations. "For a more sustainable dairy future globally, high milk demanding regions, such as China, must match the production efficiencies of the world's leading producers," says Bai. "Greenhouse gas emissions would rise much more modestly and land use would also contract." The work has drawn on several institutes in China, including the Agricultural University of Hebei and the China Agriculture University in Beijing, Wageningen University in the Netherlands, AgResearch in New Zealand, IIASA in Austria and the University of Bristol and Rothamsted Research in the UK. Historically, China consumed little milk (less than 2 kg per person per year in 1961) but increasing prosperity has lifted consumption more than 25 times over the past five decades, leading to the country becoming the world's fourth largest milk producer, with the growth projected to continue. "We examined the global impacts of China's increasing milk production under different scenarios of domestic milk production and importation, addressing the questions using a Nexus Approach," says Michael Lee, Head of Rothamsted's North Wyke Farm Platform and Professor of Sustainable Livestock Systems at Bristol Veterinary School. Though there is no single universally recognised definition, the Nexus Approach is a strategy that acknowledges the interdependencies of environmental resources, notably water, energy and food, and considers not the individual components but the influencing factors on the broadest scale. "Our findings show how changes to animal nutrition and husbandry, as well as improvements in production technologies, can meet the soaring demands for milk worldwide, both more efficiently and sustainably, for producers everywhere," notes Lee. 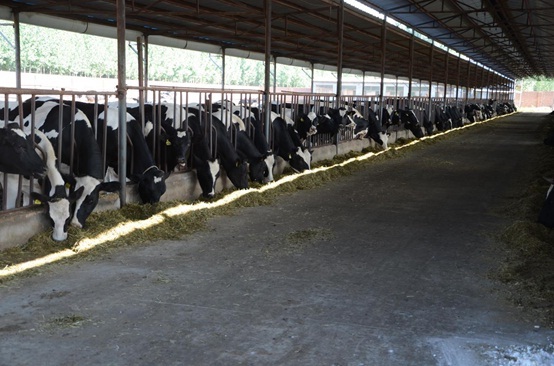 "China has much potential to improve its domestic milk and feed production efficiencies," says Lin Ma, the paper's corresponding author and a professor at the Center for Agricultural Resources Research, Institute of Genetic and Developmental Biology, Chinese Academy of Sciences.